MATERIALS 1. Internal frame, made in injected polyurethane mould, iron and suspensions in seat and back made with steel springs. FR polyurethane (UNE EN1021-2:06 / BS 5852:06) with density of 65kg/m3 covers all the frame. All covered with a foamed silicone fibre protective cover. 2. Seat cushion made with HR 40 kg/m3 foam of soybean oil. Glue used is water based. No solvents from oil products used. 3. Feet in metallic tube epoxy painted and oven dried. Fixed P-98 or swivel base. 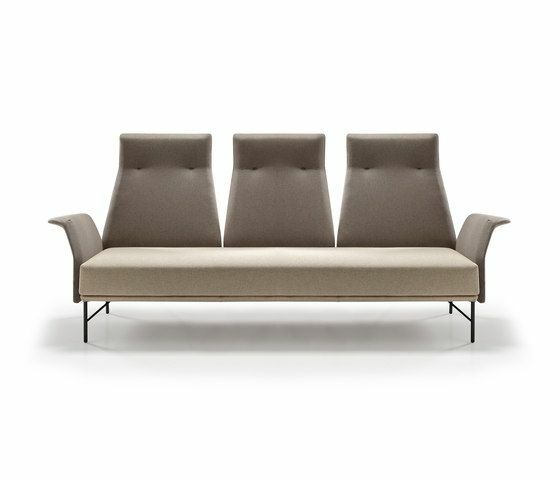 Luka is a family of armchairs, sofas and Chaise Longue to settle con- tract spaces, but also to furnish the home. The idea is to create an iconic piece, and it is achieved because of its strong personality. It may show in different versions according to their architectural intention or use, always keeping the character it has. The combination of two heights, both in the back and arm allow armchairs and sofas, low height or reading. “Open space” elements with a privacy feeling. Important: indicate the colour of the decorative stitching thread. Luka is sent in parts to be assembled in site.